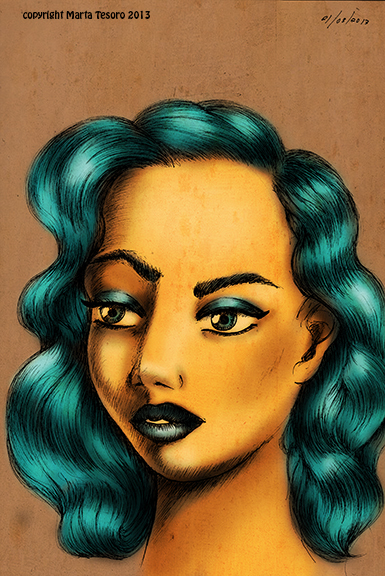 Another one of my "no pencil" drawings and then coloured in Photoshop. I did this one yesterday at the studio. I do love drawing women's faces when am stuck with what to draw, which is why I asked for drawing requests from friends on Facebook. I need some fresh ideas of what to do. Like I mentioned in a previous post, my creativity and imagination all tends to go towards my current illustration job which drains me a bit when I draw up personal works. I also need to draw up a backlog for my blog on the days when am exhausted from work. I'm about to start a contract job soon which will last a while. I will only be available for a select few jobs from next month and all illustration. I think it will be too tiring doing back to back animation jobs.